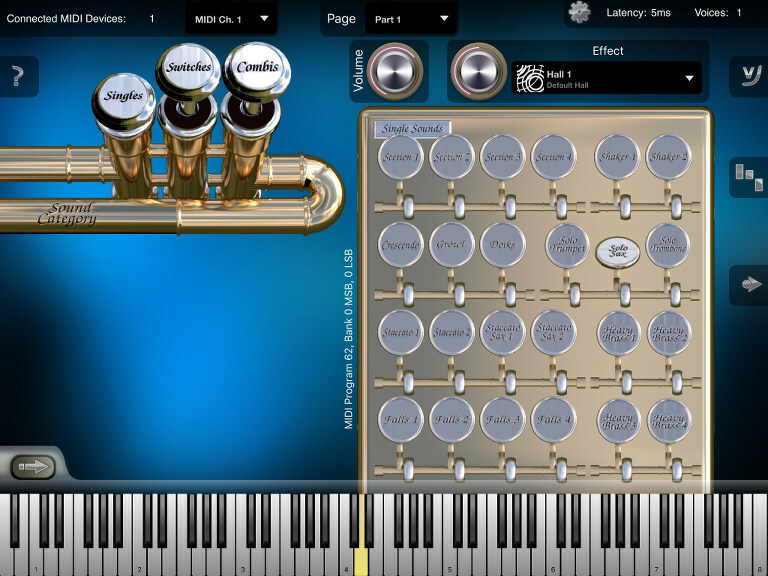 Heavy Brass delivers the most flexible and innovative approach to Saxophone, Trumpet and Trombone sounds ever provided by a virtual MIDI instrument! 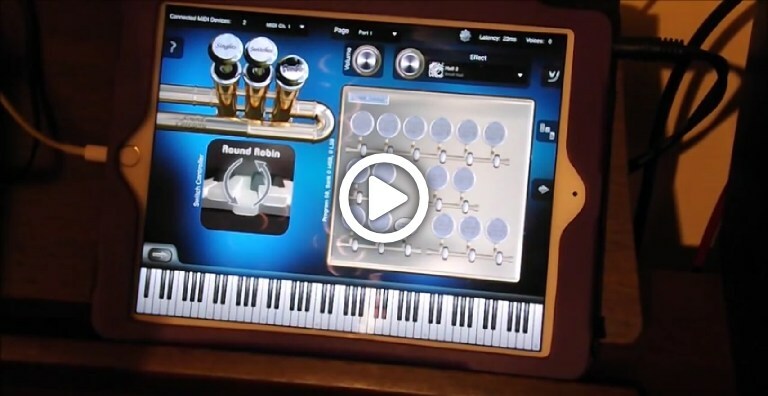 With this ultimate brass app your productions and live performances will gain such powerful and amazing tone you previously were only able to retrieve from a real brass section! 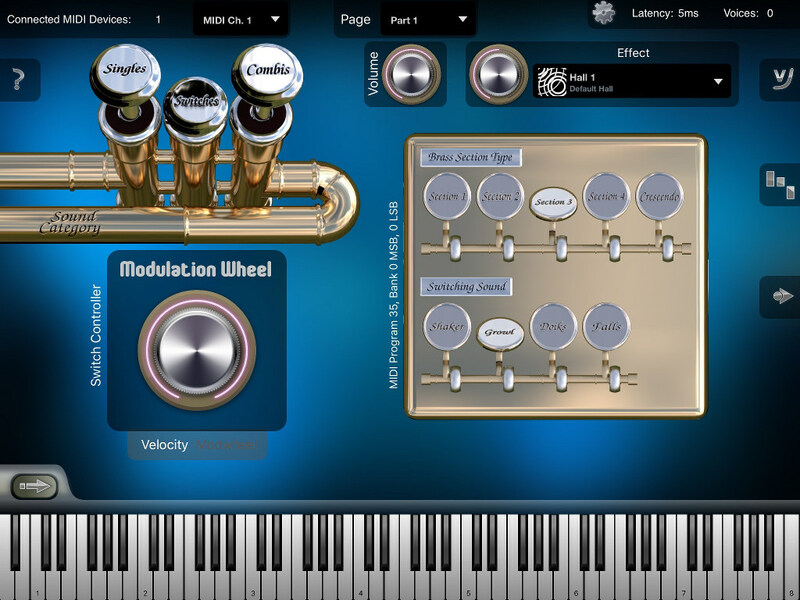 Like all our audio apps, Heavy Brass is designed as professional, virtual sound module. Simply connect an external MIDI keyboard to your iPad by using the Apple USB camera adapter or another adapter supported by Apple¹, or launch Heavy Brass as virtual instrument directly within your favourite DAW app on your iPad! This app supports Apple's Audio Unit v3 plugin standard, Audiobus, Apple's Inter-App Audio system, as well as Bluetooth LE MIDI ! 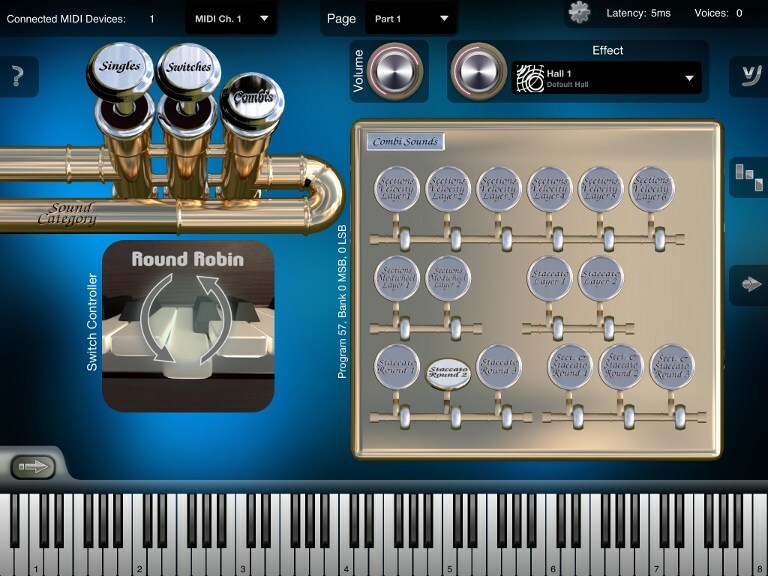 A sneak preview of Heavy Brass (v1.0.0) by thesoundtestroom.com. Sound category "Singles" contains the fundamental multi-sample brass sounds of this app. Sounds of this category are especially useful for recording purposes, i.e. when you are working on multi-track songs with your favorite DAW app: just select the specific sound(s) you really need. 21. Heavy Brass 1 NEW! 22. Heavy Brass 2 NEW! 23. Heavy Brass 3 NEW! 24. Heavy Brass 4 NEW! There are no in-app purchases in Heavy Brass. Thus all sounds mentioned on this site are already available to you after buying the app without any extra costs involved. ³ Sounds marked as NEW! above were introduced with version 1.1.1 of Heavy Brass, which was released as update on the App Store on October 28th 2016. You can configure the sound combination of those two articulation groups and whether switch or cross fade controller shall be used for the selected alternative articulation. Due to the interactive approach of these sounds, the sound category "Switches" is especially useful for live performances and for intuitively working on new musical ideas. Sounds of sound cateogory "Combis" are predefined combinations of the individual multi-sample brass sounds, use these sounds if you want to achieve a rich tone for either live performance or recording work. Some of these Combi sounds also allow to either switch (by velocity or by round robin) or crossfade (by modulation wheel) between alternative articulations, in contrast to sounds of the Switches category, this behavior is predefined for the specific combi sounds and thus not user configurable. Configurable MIDI channel or omni mode for each part. MIDI velocity response curve editor. Supports "Audio Unit v3" for being used as convenient instrument plug-in with third party mult-track DAW apps (iOS 9 or higher). Supports "Audiobus" for audio routing between apps (iOS 7 or higher). Supports Apple's "IAA" system for audio & MIDI streaming between other apps (iOS 7 or higher). 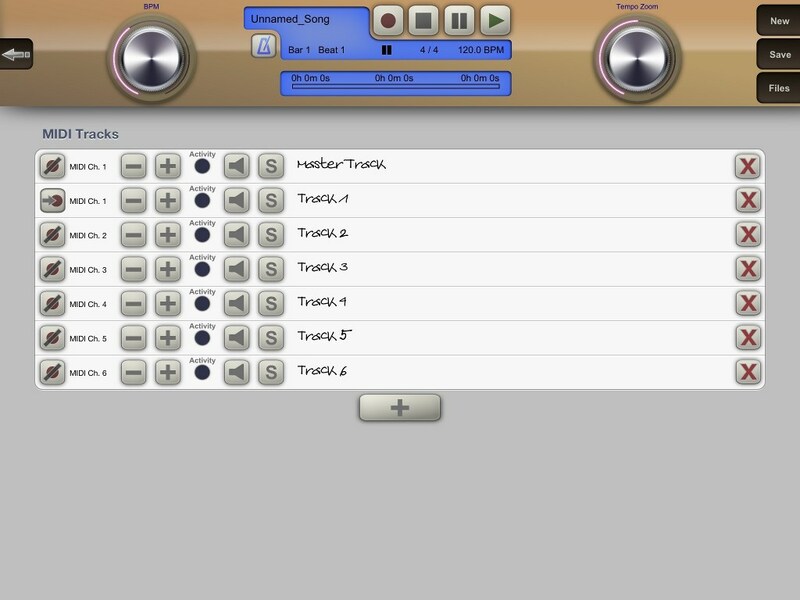 Supports JACK Audio Connection Kit for audio & MIDI streaming between other apps (up to iOS 6.1.3). Heavy Brass allows you to adjust the app's tuning system from standard well-tempered scale to any other kind of tuning system. 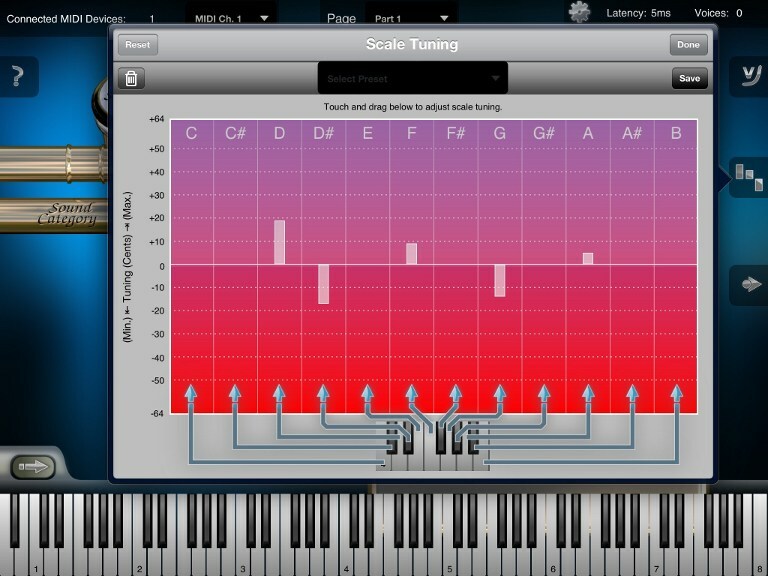 Simply open the scale tuning editor and move individual note's tuning bars with your finger. Save your favorite scales as presets and recall them at any time with one tap! Load your favorite songs as MIDI files from the Internet, and watch at the virtual keyboard how to play them. Use the "Tempo Zoom" dial knob to i.e. slow down playback at any time and learn your favorite songs more easily. Use the "BPM" dial to record new or to overwrite existing tempo changes on the master track. You are however not limited to the built-in MIDI player / recorder of course. If you prefer, you can also use any other third party Inter-App Audio capable sequencer or DAW app like i.e. Apple's Garage Band for recording your oriental tunes or simply for using Heavy Brass as virtual instrument in your favorite IAA host app. Many sounds in this app are using several voices per note. The maximum polyphony depends on the exact device model being used. Appropriate polyphony is automatically detected and selected for your specific device model by the app for you. If desired however, you can override the polyphony setting manually in the app's settings screen. For example to save CPU head room for other apps running in the background. Please Note: This app requires quite some hardware resources from the device. In case there are problems with this app, please close other apps running in the background. ¹ The adapter and / or the MIDI device you connect must be supported by the iPad / iPhone operating system in order to be able to use it with this app. To our knowledge there is currently no official list of supported devices by Apple. We recommend you to check whether your MIDI keyboard is supported by your iOS version, by using our MIDI monitor app MIDI Wrench, which is free! You've got questions? Issues? Write us! Heavy Brass is currently available for the following mobile devices. In case you encounter any problems while using this app, please report it to us by using the feedback link above. You can get Heavy Brass through iTunes from the Apple App Store. You need at least iOS 5.1.1 or later to be able to use this app. You have questions about Heavy Brass? Don't hesitate to write us by using the feedback link above. Copyright © 2019 Crudebyte. All rights reserved.